So, when you think of a salesperson, who comes to mind? For many people, it's someone closer to Kenny the Sales Weasel from Dilbert (see the video below). Good thing you and I aren't salespeople! We're project managers. Team leads. Department heads. Scrum Masters. But salespeople? No way! Or are we? Though we may not be salespeople by title, we spend concerted time on a weekly basis trying to move people--influence people--getting them to take action or agree to something or sign off on a document or hire you or show up for a meeting, or finish a task on time. 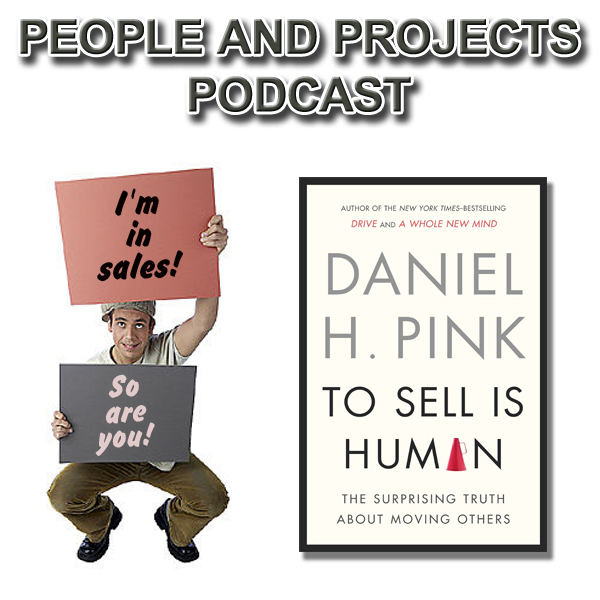 Our guest in this episode is Daniel Pink, author of the new book entitled To Sell Is Human: The Surprising Truth About Moving Others. Dan's new book can help us all be much more successful at helping move people without resorting to sleazy tricks. Whether you need contact hours for PMP®certification or PDUs, we can help! Our e-learning is engaging, informative, and even fun. Go to http://courses.i-leadonline.com/courses/advanced-project-management to get 20 PDU's for a great price. If you need contact hours to prepare for your PMP, check our PMP®Prep e-learning at http://courses.i-leadonline.com/bundles/pm-certification-exam-prep. In Dan's book he refers to the Dilbert character Kenny the Sales Weasel. Here's a video version of the cartoon! In the book, Dan talks about the benefits but also limitations of psyching yourself up. Interrogative talk is more powerful. The discussion on positive affirmations reminded me of my favorite Stuart Smalley skit on Saturday Night Live. Enjoy! Finally, here's Dan with one of my favorite past podcast guests, Dr. Adam Grant. Adam and Dan provide a great 20 minute summary of To Sell is Human. ANYTHING BUT THE TRUTH by Phil Reavis is licensed under a Attribution-NonCommercial-ShareAlike License. IF I COULD CHANGE YOUR MIND by Sloan is licensed under a Creative Commons Attribution-NonCommercial-NoDerivatives (aka Music Sharing) License.